Excavations taking place with the expansion of Norway's Main Air Station at Ørland have revealed a pre-Viking Period farm. It is sometimes claimed that the peninsula that is home to Ørland, Norway's Main Air Station, looks like the head of a seahorse with its nose pointed south. In the pre-Viking Period, however, its shape was different. The green areas on the map to the right show the position of the excavation in yellow, and dry land as it was 1,500 years ago is shown in green. It can be seen that the farm was positioned on the edge of what was once a protected bay. 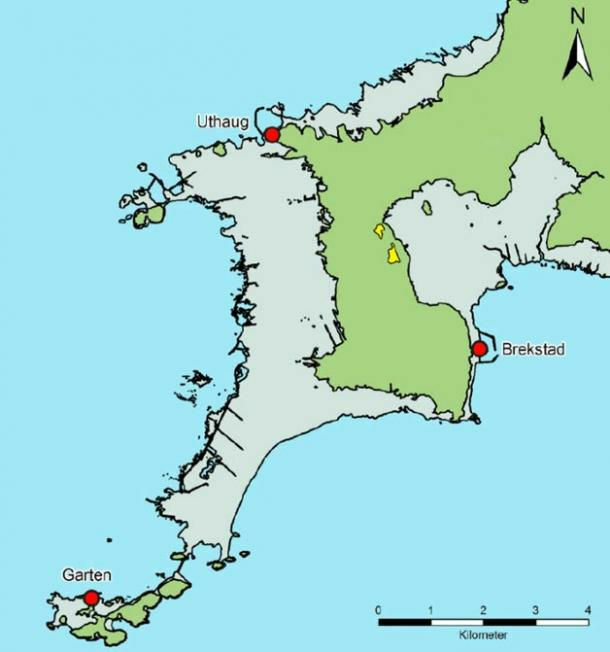 Ingrid Ystgaard, project manager at the Department of Archaeology and Cultural History at NTNU University Museum, says: "It was a sheltered area along the Norwegian coastal route from southern Norway to the northern coasts. And it was at the mouth of Trondheim Fjord, which was a vital link to Sweden and the inner regions of mid-Norway." The excavations so far have revealed that there were three buildings arranged in the shape of a U. The two longhouses that were parallel to each other measured 40 metres and 30 metres and were connected by a smaller building. Not far from here - but outside of the bounds of the present site - Ystgaard expects there are graves, too, and a harbour with boat houses.